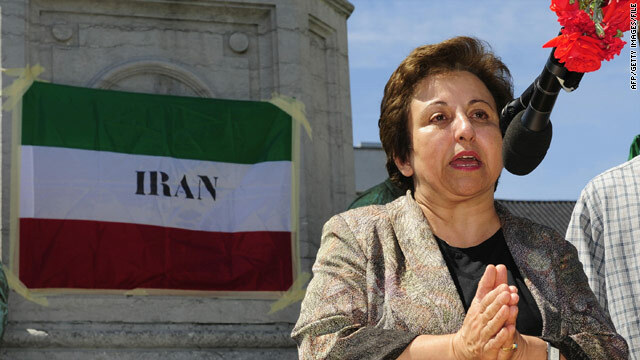 Shirin Ebadi speaks in Belgium after the disputed 2009 Iranian elections. (CNN) -- Although I have already highlighted the deteriorating human rights situation in Iran on several occasions in writing and in person, I deem it necessary to once again draw the attention of Your Honor and the distinguished members of the UNHRC to the following issues as you prepare to review the Islamic Republic of Iran's human rights record, on February 15, 2010. My compatriots have endured a difficult period. Their peaceful protests were responded with bullets and imprisonment. Many photographs and witnesses corroborate the government's violence, not to mention instances when sufficient facts and evidence were presented to the authorities and public that revealed the identity of the killers. Sadly, however, the Judiciary and other state officials have not taken any steps to arrest the killers or even reduce the level of violence. A large number of political, civil, and even cultural, activists have been arrested on unfounded charges. Some of them were sentenced to death after summary trials behind closed doors. So far, based on official figures released by the government of the Islamic Republic of Iran, four of them have been executed and more than 25 others are awaiting their impending fate. Political prisoners are treated so badly that some have died in jail and under torture. These prisoners are even deprived of the rights afforded by law to ordinary and dangerous inmates. The defenseless people of Iran are continuing to resist and insist on the realization of their just demands for democracy and human rights. There are some whose conditions are very serious because of old age and illness. They include Dr Ebrahim Yazdi, Dr Mohammad Maleki, and engineer Behzad Nabavi. The first two are almost 80 years of age and are suffering from cancer, while the third is suffering from heart problems. They receive no medical care and, because of the unsanitary prison conditions, there are fears that they could die at any moment. Tragically, the number of political prisoners who are ill and in need of medical treatment is not limited to these three; there are more than 60 political prisoners who need to be hospitalized. Iran has turned into a big prison for journalists whose only crime is to disseminate information. There are currently 63 reporters and photojournalists in Iran's prisons. Iranian students are imprisoned or barred from education for making the slightest political criticism. Iranian women who seek equal rights are charged with conspiring to overthrow the Islamic Republic; criminal proceedings have been instituted against more than 100 of these women. Workers and teachers have been accused of causing riots and disorder because they were trade union members and had protested against their low wages. Some of them have been imprisoned, and many have lost their jobs. Not only non-Muslims are persecuted -- such as members of the Baha'i faith who, since the establishment of the Islamic Republic of Iran, have not even been allowed to study at university -- but even the followers of Iran's official religion, Shi'ite Islam, have not been immune from government repression; as an example, one could cite the persecution and detention of the Gonabad Dervishes [who practice the Sufi tradition of Islam]. Even more appallingly, they have recently embarked on yet another means of exerting pressure on political and social activists, which is to take one or a few of their relatives hostage. In so doing, they aim to attain their illegitimate objectives through putting psychological pressure on the activists. In that regard, one could point to the arrest of two daughters of a human rights activist Mr. Tavassoli. Sadly, so far eight families have been victims of the same phenomenon. Meanwhile, the plight of human rights defenders is the worst because the authorities do not want any reports whatsoever on the human rights violations in Iran to leave the country. As a result, most of the known activists in Iran are either in prison or barred from traveling abroad; or they have been forced underground and into hiding. More distressingly, indictments have been issued against some of them for Moharebeh (waging war against God), which is punishable by death. Under such circumstances, the defenseless people of Iran are continuing to resist and insist on the realization of their just demands for democracy and human rights by demonstrating their political maturity through peaceful protests. My question to you in your capacity as representatives of UNHRC member states is this: For how much longer do you believe that you could urge young people to remain calm? The patience and tolerance of Iranian people, however high, is not infinite. A recurrence of the recent months' events, the continuation of the repressive policies, and the killing of defenseless people, could bring about a catastrophe that may undermine peace and security in Iran, if not in the entire region. So, I urge you, yet again, to use whatever means possible to convince the government of the Islamic Republic of Iran to abide by the resolutions adopted by the U.N. General Assembly, in particular the resolution of December 2009; to allow human rights rapporteurs, especially those who deal with arbitrary arrests, freedom of expression, religion and women's rights, to enter Iran, and to cooperate with them. I also urge you to appoint a special rapporteur on the human rights situation in Iran, who would be able to continuously monitor the government's conduct and, by offering prompt advice and suggestions, help end the political crisis and mounting repression. My honorable friends! Please bear in mind that we are all responsible and accountable to history. God forbid, lest we stand ashamed before a defenseless nation because of our political complicities.